Port Lligat Bay, with its thousand blue and brown colour shades, is one of the most beautiful and fascinating coves in the Costa Brava. It has an island located in front of it, which protects it from the tides and storms. Salvador Dali was its most famous inhabitant. 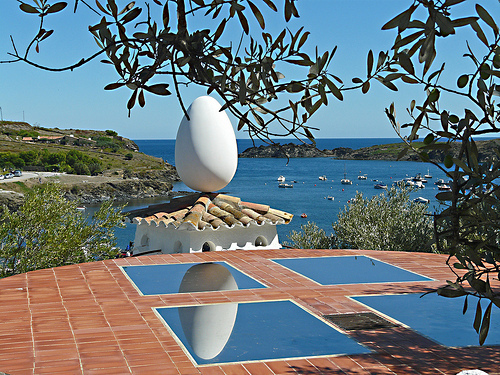 Portlligat (also written as Port Lligat) also houses one of the Dalí Museums. 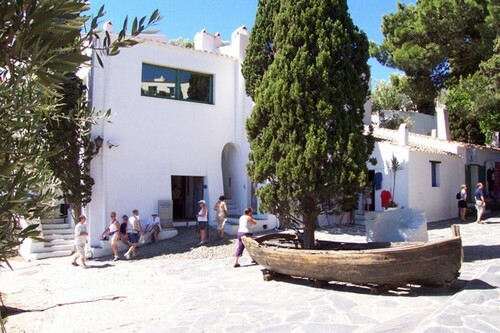 This was Dalí home since he bought it in the 30′s, when he returned from New York. In fact he acquired several fishermen houses and, with the help of some architects, he managed to fusion them through new walls and passages. A visit to this museum gives a good account of the so special configuration that has this original dalinian place. Before becoming a museum, while Dalí and his wife Gala lived in the house, great and famous stars as Federico Garcia Lorca, Picasso or Walt Disney visited it. The genial painter was always very fond of this landscape, so much that on several occasions he stated that it was “the most beautiful in the world”. 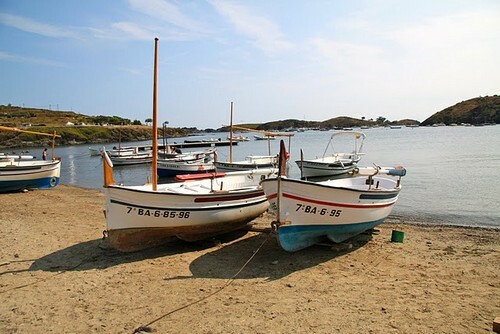 The island is about a mile long from Portlligat shore and is a very typical well recognised landscape of this bay. It was for the fishermen in the area of major importance for protection as a shelter against storms. Currently on the island you’ll only find some vegetation and some trees, although we know that in the past, as in Portlligat, there were some houses with residents, including the village postman, so that it was also known as Mail Island. If you to go swimming to reach the island from the creek you’ll find that the distance is too long, but if you start from the south of the bay, which we access through the coastal path to Ses Boquelles and Playa d’en Ton, the distance is shortened to only 60 meters. 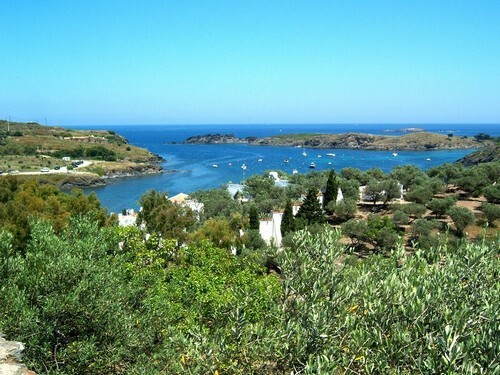 Portlligat is part of Cadaqués, so that in fact it’s not a village itself. It is formed by a few white houses of former fishermen (most of them residential homes now) and half a dozen traditional paved streets, some with ladders. It will draw your attention the spatial arrangement of these homes and the fact that the chimneys are topped by a pyramid, an old technique to prevent the north wind, the Tramuntana, to snuff out their fireplaces. Portlligat beach, on the other hand, is about 80 meters long and barely 10 meters wide. 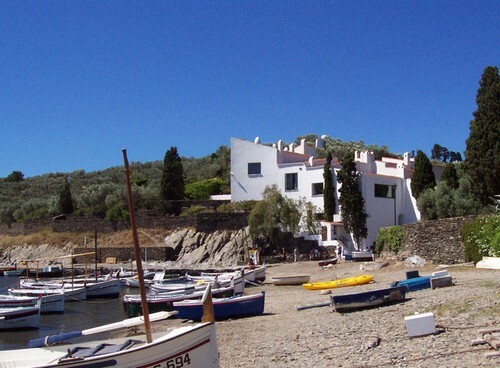 Since the creek is so small and there are many boats, the truth is that Portlligat is not one of the most attractive coves to bath, compared with others in Cadaqués that even have blue flag. So, it has bins, but no showers. Now the disabled access is fully conditioned, especially considering those who visit the museum. Another point of interest is the Ermita de Sant Baldiri (church), from 1702, which is at the top of the creek, near the cemetery.